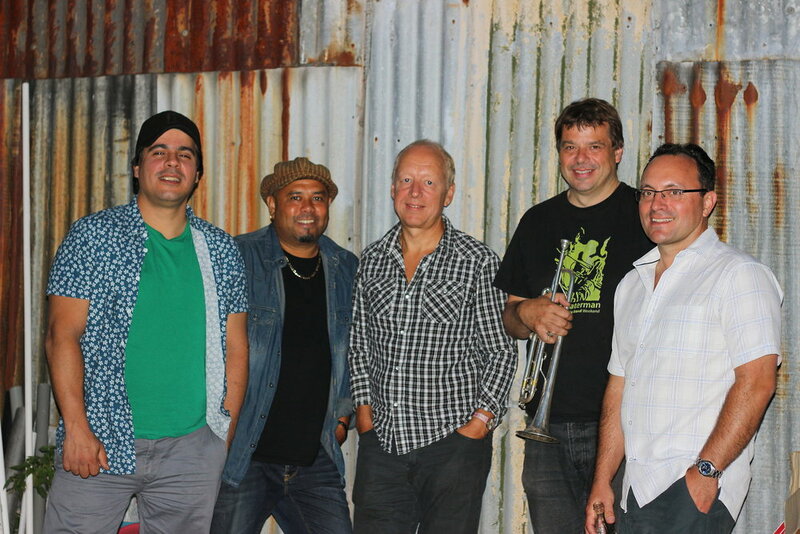 Heads South plays superb Latin Jazz combining Cuban and other Latin rhythms with distinctive melodies in an exhilarating repertoire of original and classic tunes. The Band is led by John Harriman piano/organ and features top UK trumpeter Steve Waterman, Venezuelan bassist Adolfredo Pulido, Cuban percussionist Chino Martell Morgan on congas, bongos, cajon, guiro and Buster Birch on drums, timbale, castanets, frame drum. 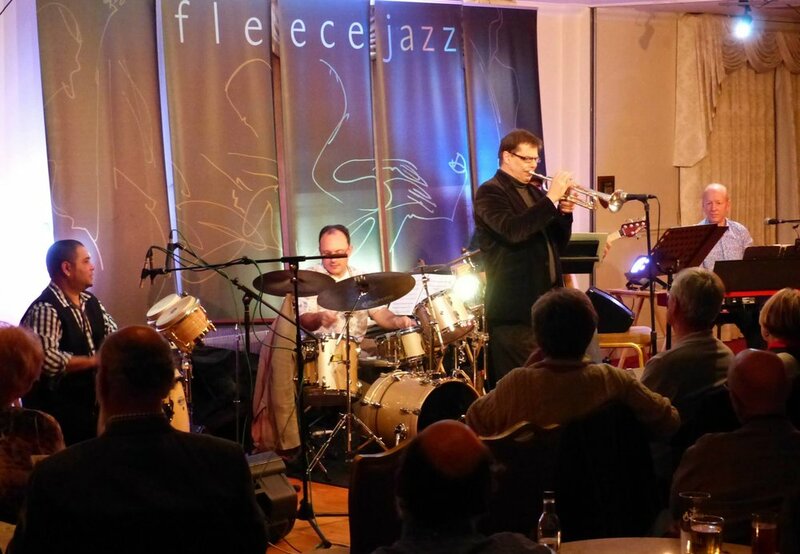 The Jazzmann Review Brycheiniog Theatre Brecon: “…The Quintet commenced with Harriman’s original El Cardenal sourced from the group’s first album. It was immediately apparent that this was a very classy band with Harriman displaying a thorough knowledge of Latin American, and particularly Afro-Cuban, melodies, rhythms and piano styles. Also impressive was the interplay between Birch and Morgan, the pair complementing each other superbly...In many respects Waterman is the quintets trump card, a highly versatile trumpeter who is well known to British jazz audiences. Ive seen him perform in [various] contexts.. However this was the first time Id witnessed this particular side of Waterman’s talent as he unleashed his inner Artruro Sandoval on a solo of impressive clarity and power, something he was to continue to do for the rest of the evening. Following an impressive Afro-Cuban styled piano solo from the composer the piece concluded with a feature for the two percussionists. Morgans set up was primarily composed of congas and timbales with Birch also supplementing his drum kit with a variety of other percussive objects. I think its fair to refer to both of them as percussionists, such was the quality and subtlety of the rhythmic interplay between them. This was no percussion battle, for even here, as throughout the evening, Birch and Morgan worked in tandem, a well oiled rhythm machine that sounded like a single organism and was greater than the sum of its parts...After the high energy opener the quintet kept the pot bubbling with a cha cha cha style arrangement of Horace Silvers The Preacher which opened with a dialogue between Harriman and Morgan before moving on to feature typically fiery solos from Waterman and Harriman. The scholarly and well spoken Harriman proved to be an authoritative and entertaining announcer of tunes and here informed us that the great Horace Silver is still alive and well at the age of eighty five.Also from Record Flight came Harrimans Petalos de Tierra (translation Earth Tears) which combined Spanish Flamenco style melodies and instruments with Afro-Cuban rhythms. Introduced by a duet between Harriman and Waterman the tune featured Morgan on cajon and such was the rhythmic drive of the piece that two female dancers left their seats and sashayed their way down to the front of the stage...A lovely version of Astor Piazzollas Milonga del Angel varied the mood and pace and presented another aspect of the Hispanic diaspora. Solo piano introduced a sublimely lyrical version of Piazzollas gorgeous melody with Waterman imperious on a beautifully controlled trumpet solo...Any lingering melancholic thoughts were quickly despatched by a lively Latinised version of Kurt Weills Mack The Knife, a hit for Louis Armstrong, Bobby Darin etc. Played in an Afro-Cuban style the piece featured solos from Waterman and Harriman plus a percussion feature that highlighted Morgans virtuosity on timbales and congas. The first half concluded with a new Harriman original that commenced with a piano/trumpet duet and saw Morgan switching to cajon. Harriman took the first solo and was followed by Pulido who demonstrated his slap bass technique as he duetted with Morgan...Set two got off to a breezy start with Vincent Youmans Carioca, a piece well known for its inclusion in the film Flying Down To Rio but here given more of an Afro-Cuban treatment with rousing solos from Waterman and Harriman and a closing percussion feature. The groups arrangement of this famous tune is the opening track on the Record Flight album Manana De Carnaval saw Harriman switching to a Nord Stage 2 keyboard set to Hammond organ mode. He made good use of the instrument, soloing effectively alongside the consistently excellent Waterman.The trumpeter took over the compositional reins on Nowhere To Go, a tune from the groups first album. Written in 6/8 the piece featured the leaders trumpet whilst giving Morgans congas a prominent place in the arrangement. A bass/drum/percussion interlude featuring Pulido, Birch and Morgan explored the rhythmic possibilities of the tune, the interlocking grooves a consistent source of fascination.Solo bass introduced a radically slowed down version of the old chestnut Besame Mucho which also featured Waterman on a stunning solo trumpet cadenza.The evening concluded with a final untitled Harriman original, a spirited bass and cajon driven romp featuring dazzling solos from Harriman, arguably his best of the night, and Waterman, plus a final bass/drums/percussion interface.....This is a band that is well worth seeing... "
Fleece Jazz Club: "The percussionist Chino Martell Morgan and the drummer Buster Birch were in each other's heads throughout the evening...they were as enjoyable to watch as they were to hear. 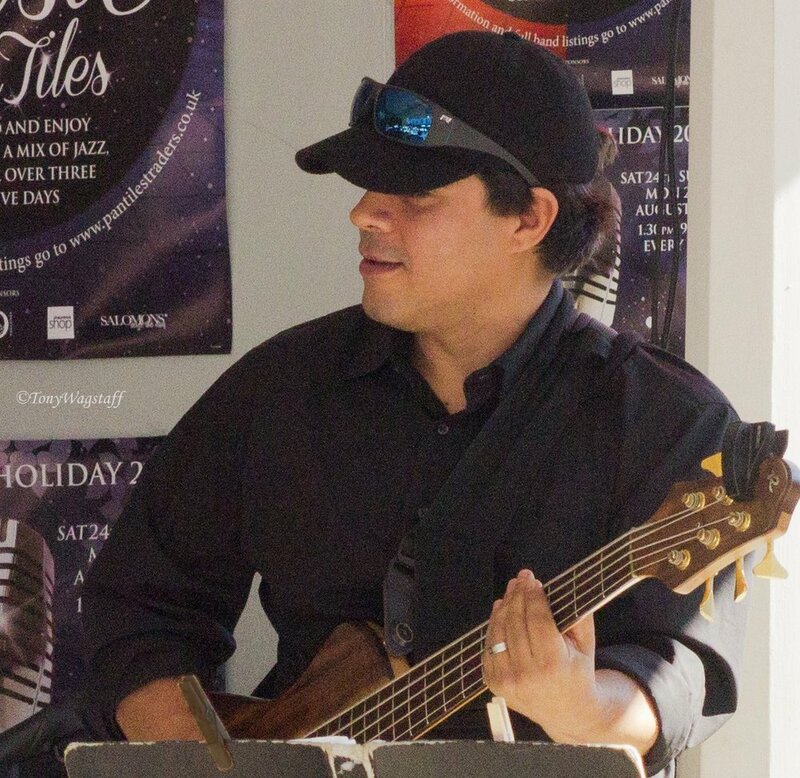 Waterman's playing is just so inventive and ppassionate - perfect for this music...Adolfredo Pulido is a superb electric bass guitarist. The music is part of his soul as well and that came across clearly..Harriman used the keyboard's very good piano and organ to great effect, both in support and soloing..This was a gig thoroughly enjoyed by the audience"
The Gig Guide Review Folkestone Jazz Club: “Heads South is a refreshing cultural mix of players with outstanding jazz credentials. 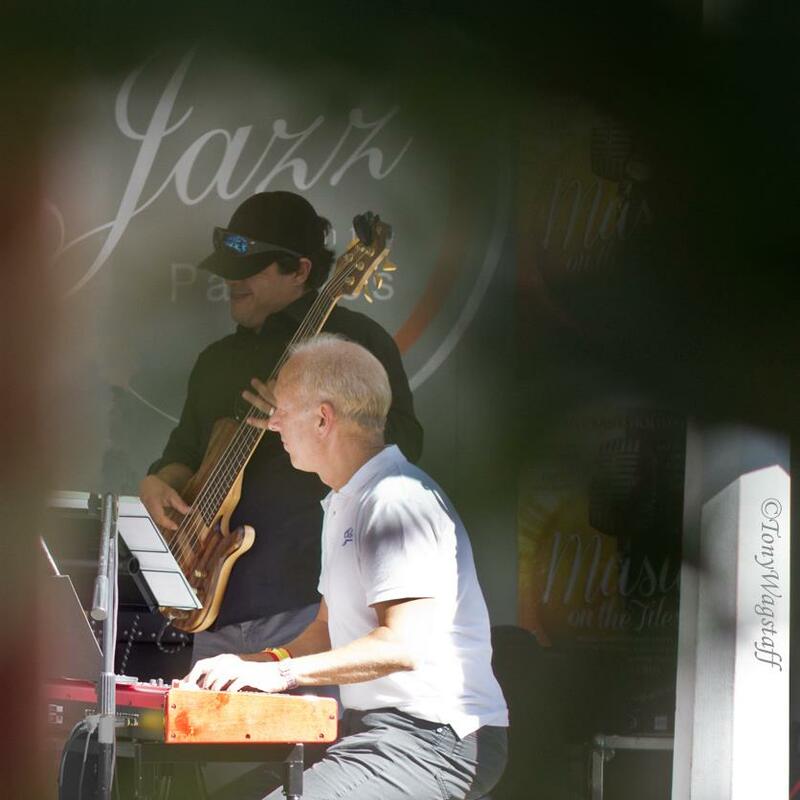 Their music is a blend of original pieces and cleverly arranged jazz classics. 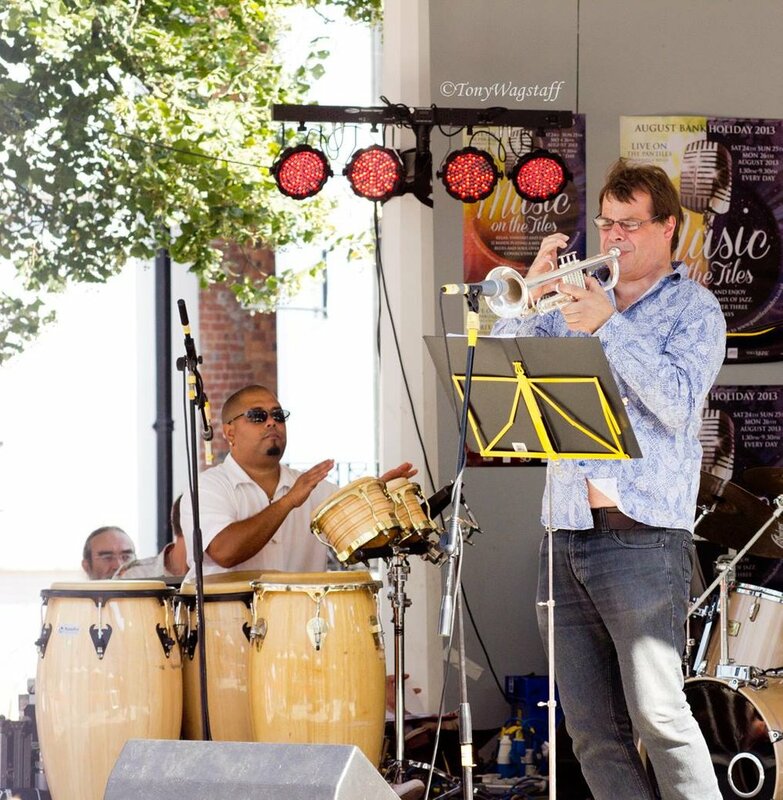 Cuban rhythms dominate giving the music its distinct Latin jazz feel. The highlight of a varied and lively opening set was an original salsa number El Cardenal which is a musical reflection on the composers choir days. It featured some rocking syncopated percussion and drum soloing. The second set included reworkings of the well known jazz classics Mack the Knife and Guantanamera, the latter provoking a bit of audience participation but thankfully no chants of one team in Europe. Arguably the best tune of the evening was the album piece Sweet Swan which included an excellent piano solo and some crisp and bluesy Hubbardesque trumpet playing. Heads South is a fine jazz band and well worth watching. They have dates booked in venues across the South East over the next few months. 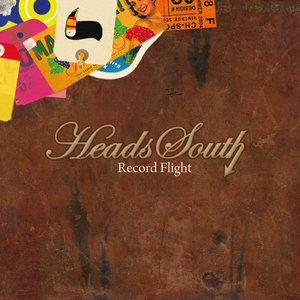 You can check this out along with some of the tunes on their website www.headssouth.com".